This is the first installment in an ongoing series of posts dedicated to mysterious places and creatures that are "New to Me." Yes, that's right. I don't know everything. It came as a shock to me, too. 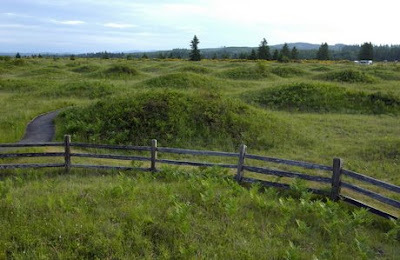 Today's post focuses on the Mima Mounds. These are large mounds of earth found throughout the world--Australia, China, Africa, Mexico, and right here in the good old USA. They are almost always the same size (between 3 and 6 feet tall), and they often appear in evenly-spaced rows. Here's the kicker--no one knows what exactly the Mima Mounds are or how they were constructed. There are lots of theories--most involving earthquakes, ancient tribes, glaciers, or giant gophers. But honest scientists will be the first to admit that they haven't a clue how the Mima Mounds came to speckle the planet. Read more about the mounds here, and report back to Ananka's Diary with YOUR theories! Those are so incredibly interesting! Wow. I bet that some animal has something to do with it. Maybe a massive colony of cockroaches or the likes have bred their way into taking over the world from the bottom up? Jk. Anyway, I wish there was a scientific explanation for them! I think that maybe they r burial mounds or something. Scietnists: I say bring out the old shovel! Im thinking aliens...... does anyone agree w/ me???? Wow . . . I have some of those in my back yard. Here's what happened. Approximately twenty-five thousand years ago, there lived what you might call giant "gophers". They ate the insects and other creatures that lived in the soil, and never once resurfaced. But as the ice age grew nearer, the "gophers" began to crave warmth. 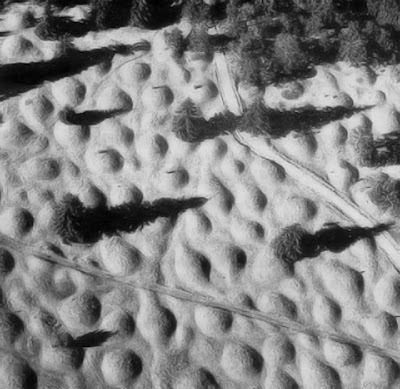 They burrowed further and further upward, until finally they were pressing right up against the surface, which created the mima mounds. That, however wasn't warm enough for the gophers, and they began to burrow down. They finally reached magma, and sadly, that is the end of their story. Mystery solved. Here's the deal: Approximately 22,000 years ago, there lived what you might call giant, blind, naked gophers. They lived in peace eating insects and the creatures of the soil. That is, until the ice age came. As the ground grew colder, the "gophers" began to crave warmth. They began burrowing upward, searching for hotter soil. They finally reached the just below surface, creating the mima mounds. But even that wasn't warm enough. They dug downward this time, further and further until they finally reached magma. Sadly, that is they end of their story. I was thinking aliens, but peace peeps makes a good point. Hamsters from Pluto(is too a planet! ), anyone? Anonymous: Love your explanation. Love the fact that you came up with two slightly different explanations even more. Hobbits. Thats all. So simple. Hobbit holes. I kept seeing them on DRB but I never clicked on it. Oh well. Frodo's in for a rude awakening! I think it's houses for giant cute caterpillars. You know, the kind that come out of the ground w/ big cute eyes and yellow top hats w/ flowers it them w/ dandy looks on their faces and chain saws tucked away in their pockets. Those kind. I'm guessing thata there is a much simimpler explanation. How about: Oh! The wind blew mounds! How exiting! Primitive People: The Mounds are the Homes of Gods. We must build more. Thus the worlds first suberbs came about. I think thy are left over from the Pre-Historic ages. I think that there used to be HUGE snaks and those are it's slither prints. Maybe they're like in that book where at the bottom of your swimming pool, a water dryad or something like that lives in your water filter or whatever that thing at the bottom of your swimming pool is and in your yard you're waiting for this giant eagle or something and you have to be careful or else these wolves who disguise themselves as mounds of grass wait to eat you, or something like that. Except I think the wolves are considerably smaller. I think its gas trapped underground, and in an effort to distibute itself has broken apart and swollen the ground. :) I don't know what kind of gasses would have the ability though. Also, siesmic activity seems pretty likely, however, it would mean that there are smaller tectonic plates on top of th larger ones, abolishing how we previously look at it. :) cool. Mima Mounds are just this ... the end product of a freeze/refreeze cycle in a permafrost area. More than 25% of the world was once glaciated. While these mounds are unusual they are not at all unique or unusual, what is interesting is some of the names associated with management of this site 'Birdie' and 'Princess'. I really wish for a scientific explanation for these. Creative, Yes. Hygienic, Not Exactly.